This article is the first in a series of four articles with sequences designed to help practitioners of all levels build toward, or improve, urdhva dhanurasana (upward bow pose). Doing these sequences consistently will develop the understanding, willpower, stamina, and mobility required to progress in this pose. Consider, for a moment, a bow. As an archer pulls back a bow, an even amount of tension is applied that creates the potential power for delivering the arrow to its intended target. In urdhva dhanurasana, the arms and legs need to work in conjunction with the torso in order to create a bend that’s evenly distributed throughout the entire posture. When the curve of the bow is not even, even an experienced practitioner will feel compression or discomfort in their back or shoulders. But when the legs and arms work optimally, the torso experiences a sense of traction and length, rather than the all-too-familiar experience of low-back jamming that results when they don’t pull their weight. As you practice this sequence, hold the image of the bow in your mind and body. Use your strength to contract your muscles in each pose, and keep them toned as you find the expansion in each shape. Tune in to a sense of smooth-flowing energy throughout your legs and arms that provides traction to your torso. Remember: You are loading a bow with power. Keep in mind that not all bodies can (or should) bend in the same ways. Even if we aim for a specific pose in our practice, the process of working intelligently with the component aspects of the posture can be more important than the pose itself. In fact, the following sequence does not culminate in urdhva dhanurasana. Consider this sequence to be about exploration and preparation. Experienced students already familiar with urdhva dhanurasana may choose to add it near the end of the practice (perhaps after chatush padasana). The following props may be helpful: two blocks, a strap, a blanket, and a bolster. 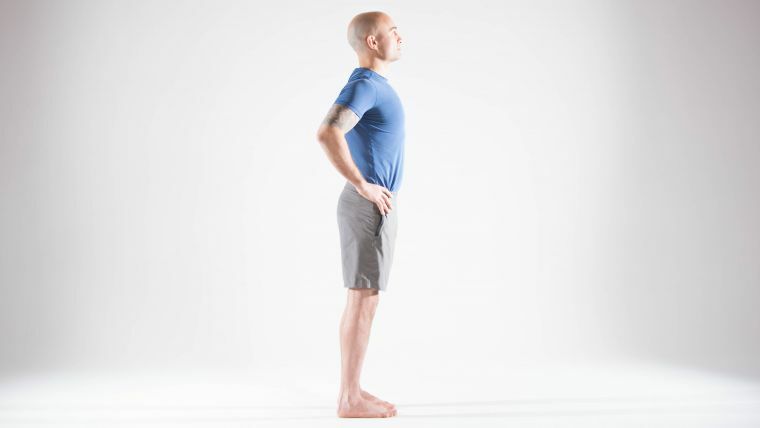 Stand in tadasana (mountain pose) with your feet hip distance apart. As you inhale, contract your quadriceps and hamstrings. To engage your quadriceps, lift your kneecaps. To activate your hamstrings, as you anchor your heels into the floor, isometrically draw your heels toward your hips as though you were going to bend your knees. As you exhale, interlace your hands behind you. If you can’t interlace your hands, use a strap to make the clasp. Inhale and lift your chest. Exhale and bend forward with strong legs, reaching your arms toward the front of your mat. Inhale. On your next exhale, place your hands on the floor or on blocks beside your feet. Inhale and step your left foot back to a lunge. Place your left knee on the floor or a blanket as you exhale. Inhale and bring your torso upright with your hands on your hips. Exhale and interlace your hands behind you once again. Inhale and lift your chest. Exhale and reach your hands toward your left foot as you continue reaching your chest forward. Inhale. With your next exhale, place your hands on the floor or on your blocks beside your right foot. Inhale and lift your left knee off the floor. Exhale and step your left foot forward. Switch sides. 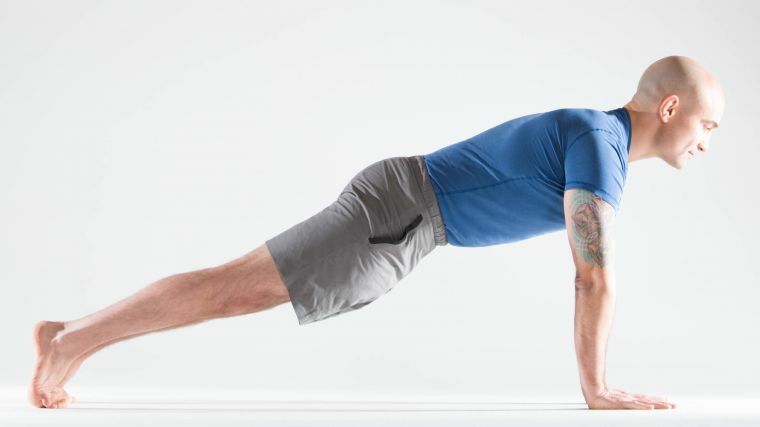 After you finish the second side, step back to plank on an exhale. Hold plank as you inhale. Exhale and lower your abdomen to the floor. Rest your forehead on the floor and interlace your hands behind your back. Draw your shoulders and arms back. On your next inhale, lift your head, shoulders, and legs off the floor, keeping your legs strong and straight. Maintain your height as you exhale and lift again as your inhale. Slowly lower as you exhale. Place your hands by the sides of your chest and push up to all fours and then to downward facing dog pose. Hold for several breath cycles, then step forward to uttanasana (standing forward bend). 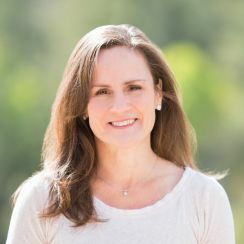 Place your hands on your hips, draw your arms and shoulders back, and inhaling, come to tadasana with strong legs, and with your arms and upper back fully engaged. Repeat this surya namaskar variation one to four times. Then practice the following sequence once or twice, depending on your stamina and the amount of time that you have available. Using a strap helps you to create tremendous power through your arms, allowing you to experience how they contribute to the traction in your torso. Stand with your feet hip distance apart. Place a strap right under your shoulder blades and secure it against your body with your arms. Hold the tails with your hands. Push down into the floor with strong legs and reach your arms overhead. Straighten your arms. Toning your abdomen, pull up on the strap and continue to stretch your arms actively toward the sky. Stay for five breaths. With your legs wider than usual, this down dog variation helps create space in the hips, which allows you to activate your legs even if your hips are restricted. When your legs are well activated in down dog, you can feel how they contribute to the traction in your torso. Come to all fours. Place your hands directly under your shoulders and your knees directly under your hips. Tuck your toes under and lift your hips up and back. Take your feet as wide as your mat. Bend your knees and come onto the balls of your feet. Without actually moving them, push your hands down into the floor and then forward toward the front of your mat until you feel some length in your torso. Next, staying on the balls of your feet, straighten your legs, tone your low belly to stabilize your lumbar spine, and then stretch your heels to the floor. As you push down and forward with your hands, press your thighs back to bring even more length into your torso. Explore this variation for five breaths. From tadasana, turn to the side and step your feet wide (approximately four to four and a half feet, depending on the length of your legs). Turn your right leg out 90 degrees. Line your right heel up with the arch of your left foot. Bend your right knee until your right thigh is parallel to the floor, and place your right forearm on your thigh. Stretch your left arm overhead, creating a straight line along the entire left side of your body. Tone the fronts and backs of your legs and push your feet into the floor as you reach through your left arm (as though you were pulling on the strap in urdhva hastasana). The more strongly you push down through your legs and reach through your arm, the more length will be created in your torso. Look straight ahead. Hold for five breaths and then switch sides. From tadasana, turn to the side and step your feet wide. Turn your right leg out 90 degrees, and line up your right heel with the arch of your left foot. With both legs straight and strong, place your right hand on a block by the side of your right shin (using the block will help to activate the stretch along the side of the torso and de-emphasize the flexibility work of the legs so that there is more access to the strength of the legs). Stretch your left arm overhead, keeping it straight. Tone the fronts and backs of your legs and push your feet into the floor as you reach through your left arm (again, as though you were pulling on the strap in urdhva hastasana). The stronger you push through your legs and reach through your arm, the more length will be created in your torso. Look straight ahead. Hold for five breaths and then switch sides. This version of revolved triangle is done with dynamic movement to create mobility. There is no need to hurry—use a slow ujjayi breath to pace yourself. Pay particular attention to the tone in your legs to stabilize your pelvis as you twist. Begin in tadasana, standing at the center of your mat and facing the long edge, and step your feet three to three and a half feet apart (not as wide as you would for trikonasana and parsvakonasana). Turn your left leg strongly in. Turn your right leg out 90 degrees and turn your torso to face forward (toward the front edge of your mat). Inhale and firm your inner thighs toward each other. Firm your outer hips in to bring a sense of compactness to your pelvis. As you exhale, fold forward and place your left hand on the block outside your right foot, twisting to the right and reaching your right arm up to the sky. As you inhale, push into your feet to untwist and come to standing; turn your right leg in strongly and your left leg out, and then, exhaling, place your right hand on the block on the outside of your left foot, twisting to the left and reaching your left arm up to the sky. Inhale, push into your feet to untwist and return to standing. Repeat this flow four more times, working with your breath. From tadasana, turn to the side and step your feet wide. Place the strap under your shoulder blades, holding the tails in front of you. Stretch your arms straight up overhead on an inhale. Turn your left leg strongly in, turn your right leg out, and turn your torso to face forward, as you did in parivrtta trikonasana. Firm your inner thighs toward each other. Firm your outer hips in to bring a sense of compactness to your pelvis. Pull up on the strap as you did in urdhva hastasana. On an exhale, bend your front knee to a 90-degree angle. Once again, actively work your legs and arms to create a sense of traction in your torso. Do not worry if your pelvis is not squared to the front edge of your mat—focus instead on creating compactness in your pelvis by toning your inner thighs and outer hips and work to get your chest facing forward (which will require a strong twisting action in your abdomen). Hold for five breaths and switch sides. Stand in tadasana with your legs together. Inhale and stretch your arms overhead and interlace your fingers. Extend your forefingers toward the ceiling. Reach up, as if you were pulling on the tails of the strap. As you exhale, bend your knees, reach your hips back, and “sit” until your thighs are almost parallel to the floor. Chances are that your torso will come forward and your low back will arch. Squeeze your knees together, tone your outer hips in, and firm your low belly to create length in your lumbar spine (but not so much that the top of your pelvis tilts back). With strong legs and low belly, lift your chest and reach your arms up until you feel traction in your torso. Hold for five breaths, then straighten your legs and lower your arms. Kneel on the floor or a blanket with your legs hip distance apart, and tuck your toes under. Place your hands on your hips. As you inhale, resist your legs toward each other and lift your chest strongly. Exhaling, move your shoulders and arms back. Press your toes down. Contract your glutes and move your pelvis forward until your thighs are perpendicular to the floor. Continue to lift your chest, and bring your hands to your ankles or heels. If you are somewhat stiff in your back, place a bolster on your calves and your hands on the bolster. The traction we have been searching for is harder to find in ustrasana. Pushing your toes down and lifting your chest up is key to distributing the bend more evenly through your back. Hold for five breaths, and then, on an inhale, lead with your chest and bring your torso to vertical. Bring your shins together and sit for a moment in vajrasana (thunderbolt pose). Then come into downward facing dog for a few breaths. Lie down on your abdomen. Place a thickly rolled blanket under your lower ribs. Bend your legs and take hold of the outsides of your ankles with your hands. Flex your feet and kick back strongly until the power of your legs lifts your chest. Continue to kick your feet back and reach your chest forward. After five breaths, slowly release. Lie on your back. Bend your knees. Grab hold of the fronts of your ankles with your hands and place your feet on the floor in front of your hips. If you can’t grab your ankles, use a strap to assist you. Pressing your feet into the floor, lift your hips. Pulling on your ankles will give you more lift in your chest. As your chest lifts, press your feet into the floor, tone your buttocks, and lift your hips higher. By using your arms and legs dynamically in the pose, the arch you create will be deeper and stronger. As you work your buttocks, keep the tone in your inner thighs so that the actions of the hamstrings and glutes are balanced with those of the inner thighs, and your knees don’t splay wider than your hips. Stay for five breaths, then release to the floor with control. Lie on your back. Bend your right knee, and interlace your hands behind your right thigh. Press your thigh into your hands until your arms are straight and your thigh is perpendicular to the floor. Straighten your left leg and press it firmly into the ground. Straighten your right leg. Stay for five breaths, and then switch sides. Lie on your back. Bend your knees and place your feet on the floor slightly wider than hip distance apart. Let your knees rest against each other and your arms alongside your body. You have created strong work in your legs and arms and loaded your body with power. As you rest, turn your attention away from the outer work of the postures. Direct your attention at the strength inside of you. Regardless of who you are, asana practice can help you aim at what is deep, true, and whole within you.